Budgeting, balancing, banking and money are all very stressful things that everyone has to deal with. Whether you make $25,000 or $100,000 a year, having a monthly budget can help you manage your money properly. The problem is not many people know where to start. 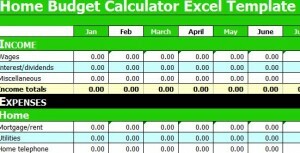 An excel template has rows and columns that can help organize your monthly budget. 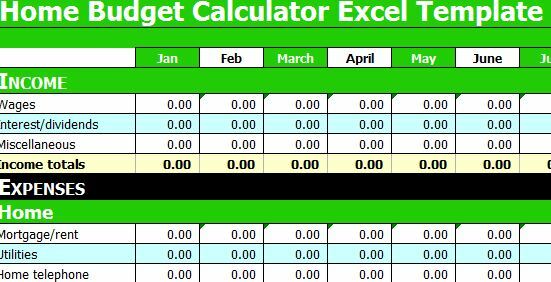 One can easily get back on track with a monthly budget calculator Excel template. You can start off by making an Excel sheet dedicated to the money coming in during the month. Each form of income can have its own row. For example, Sarah’s teaching job income can be in one row and her outside tutoring income can have another. Along the top of this sheet can be columns for dates. That way, you can see what day Sarah got paid for her teaching job by looking at the columns and rows. Not only will you know when you got paid during the month, but you can set up an Excel function to add the all income. This is very helpful because after you take out all the deductions for bills, food and other necessities you can see how much you have left over for savings and social events. Make another page for money you spend on necessities. You can divide the document into sections: home, phone, television and Internet, etc. Within the home section, you can make a title column for labels like mortgage, heat, water, and garbage pick-up. In each of the rows you can write how much you paid for that specific expense. Continue this process with each of the other sections. After each section is completed, you can add a function to make each section’s subtotal and an overall total. This allows you to see how much you are paying for each section and overall. This can help you see where you are spending too much and where you can cut back. Having all your expenses and income in one document is a great way to stick to a budget. Once you set up the document, all you have to do is add totals throughout the month. A monthly budget calculator can help you see where your money is going and keep your finances in order. Download our free template for your monthly budget.